The 132nd St. Mellons Agricultural Show will take place in the grounds of Tredegar House on Wednesday August 10, from 8:30am till 6:00pm. The show will include: Cattle and Sheep, Pigs and Goats, Horses and Ponies, Showjumping, Farriery, Dogs and Rabbits, Caged Birds, Vintage Tractors, Trade Stands, Craft Tent, Rural Crafts and Past Times, Children's Competitions, Children's Amusements, and Main Ring Attractions. Prices: Adults £6 Children £4 OAP £4. Car Parking is free. The setting is very fitting, as for many centuries Tredegar was primarily an agricultural estate. Perhaps the figure who was best known to the local farming community was Sir Charles Morgan (1760-1846) who was called 'The Farmer's Friend'. 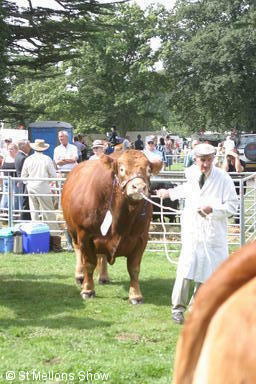 He had a passion for agriculture, paid for Newport's Cattle Market in 1844, and was instrumental in the introduction of short-horned cattle into Monmouthshire. There is a painting at Tredegar House (in the Morning Room) showing Sir Charles presenting a short-horn bull to King William IV in front of Windsor Castle.